The American Academy in Rome is truly a unique and exciting place. Prominent scholars, architects, and artists from around the United States are brought together for just under one year to share not only the beautiful space but also their ideas. The hope is that this experience will change the way a person thinks about their own work for the better. My wife had the opportunity to embrace this change as a fellow at the Academy this past year in her work on the intersection of ancient Judaism and empire in the Near East. She successfully defended her dissertation this past May and will be continuing her career as an Assistant Professor at UCLA this fall. Following in the footsteps of my wife, I made sure to take advantage of my time at the Academy. In addition to bringing in talented academic and artistic types, the Academy also has an amazing program known as the Rome Sustainable Food Project (RSFP) that was initiated by one of the founders of the farm-to-table movement. The RSFP's major goal is to provide the community with seasonal, nutritious, and delicious food that is both simple and sustainable. The RSFP has a dedicated cooking staff along with a rotating intern staff that rotates approximately every 3 months. Every year the RSFP hosts a dinner known as the Cortile Dinner during which fellows, trustees, and staff sit down community style to discuss the successes and pitfalls of the year behind them. Luckily for me the Head Chef during my stint at the Academy was Chris Behr, a supremely kind and friendly guy from New Jersey who is a self proclaimed meat lover. Similar to me, Chris loves a glass of delicious beer in his hand. 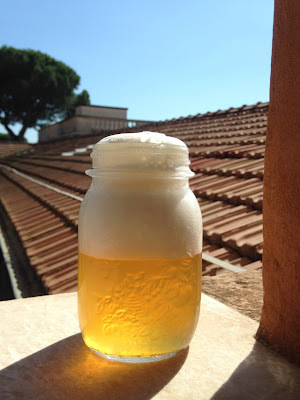 In the middle of winter I received an exciting but daunting e-mail from Chris asking me if I would be interested in brewing a beer for the Cortile Dinner. After some quick thoughts on the logistics of brewing enough beer for around one hundred people, I accepted his offer. After accepting, I also realized that not only would I be brewing a lot of beer, but I'd be brewing it for people who may not drink beer or may be directly opposed to it. The first step I took was to ask for input from the kitchen staff on what they wanted. I was told it needed to be light, refreshing, low in hop character, and pair well with food. I instantly knew that Saison was the right choice for such a beer. Saison beer has the ability to be complex while maintaining that crispy finish that everyone seeks in refreshing beer. Additionally, I've found that people not normally open to trying new styles of beer open up when they drink beer fermented with Belgian yeast. Belgian beer is unique in that it can be fruity, spicy, and earthy without an intense bitterness some may be averse to. Using the guidance from the kitchen staff and knowing my clientele, I assembled a recipe for the first test batch that I deemed approachable with a characterful Saison "edge." My ultimate goal was a beer that looked like a Belgian Table beer but with a little more flare. I took inspiration from Allagash's Hoppy Table Beer, Central State's Table, and Creature Comfort's Table Beer. I garnered information on ingredients and brewing specifications from each company's website. As was expected, each beer appeared to be low in alcohol (~4 to 5% ABV) to allow for the enjoyment of multiple pints in one sitting. Additionally, I found an emphasis on flavorful, full malt character balanced by an expressive yeast or hop character. Following my research I decided to hone in on a couple of descriptors: earthy, spicy, and malty. I chose to incorporate both flaked rye and flaked spelt for a malt-forward grainy character. I decided to subtly hop the beer with East Kent Goldings and Styrian Goldings to lend spicy and earthy notes. As for yeast, I chose to split the test batch in half to evaluate two yeasts side by side. I began with yeasts I have the most experience with: White Labs Belgian Saison I (WLP565) and Wyeast Farmhouse Ale (3726). For the first test batch I shot for the lower end of the alcohol content range by aiming for a starting specific gravity of approximately 1.038. The yeast was pitched at ~21℃ and the beers were allowed to ferment at room temperature (~21 to 24℃ ambient). Additionally, they were open fermented during high krausen (around 3 days) to allow the yeast access to oxygen and to minimize CO2 toxicity. The Belgian Saison yeast attenuated as expected to yield a 4.2% ABV beer. The Farmhouse Ale yeast attenuated less than I expected, yielding a modest 3.8% ABV beer. I couldn't help but wonder if my Farmhouse Ale culture was getting a little tired. Following approximately 8 to 10 days in the fermenter, the beers were packaged with priming sugar to 2.7 volumes of CO2. Once the beers were carbonated, they were chilled for a couple of days before being evaluated by myself and the kitchen staff. When judgement day came, Belgian Saison was the victor. Farmhouse Ale was fairly neutral with a very subtle earthiness that gave way to a distinctly one noted malty finish. Belgian Saison stood out. It had a beautiful spice profile and there was a subtle acidity that gave the beer an extra leg up. Following the evaluation, I asked for constructive criticism. The feedback I received from the staff was that the beers needed a little more oomph. Using this feedback, I decided to increase my starting specific gravity for the second test batch to 1.044. Additionally, I decided to pitch the yeast warmer at 24℃ to encourage the production of esters and phenols for enhanced yeast expression. Following the decided victory of Belgian Saison, I decided to put it to the test by pitting it again The Yeast Bay's Saison Blend. The descriptors from both company's websites indicate they have a "classic" saison character that embody the saison style. In this day and age, that means they should produce results similar to Brasserie Dupont's yeast profile. I followed the same brewing regimen as the first test batch with the noted changes and returned to the kitchen staff for round two. The second evaluation of the beer was a little different than the first. After pouring each beer and testing them side by side, the group couldn't seem to decide on a favorite. Belgian Saison again came in with that classic peppery character and a refreshing tartness. Saison Blend brought a unique earthiness with subtle notes of clove all while leaving enough room for the malt to shine. Following the taste test, the members of the kitchen staff seemed to be split 50/50. Both test batches were thought to be good enough to proceed, but I was told to wait until further notice. Fast forward a couple of days and the decision had been made: the preferred yeast of choice for the Cortile Dinner would be The Yeast Bay Saison Blend. This was not a decision of which strain or blend of strains was "better," but simply a preference for what would work the best given the intended audience. For the official batch, my goal was to produce approximately 40 L of packaged beer. This quantity would serve around 120 people where two people would split one 0.5 L bottle and the additional volume would allow for some extra "just-in-case" bottles. The kettle I purchased for brewing in Italy was 25 L and it was common to lose around 10 L of water to boil off and 2 to 4 L to trub. Therefore, my finished batch size was typically on the order of 11 to 13 L of wort. Crunching the numbers I decided that each brew day I would need to produce two batches of wort to fill a fermenter with at least 22 L before pitching yeast. Each brew day was successful in producing 22 L of 1.044 specific gravity wort. Fermentations progressed well and according to schedule, similar to the smaller, split test batches. 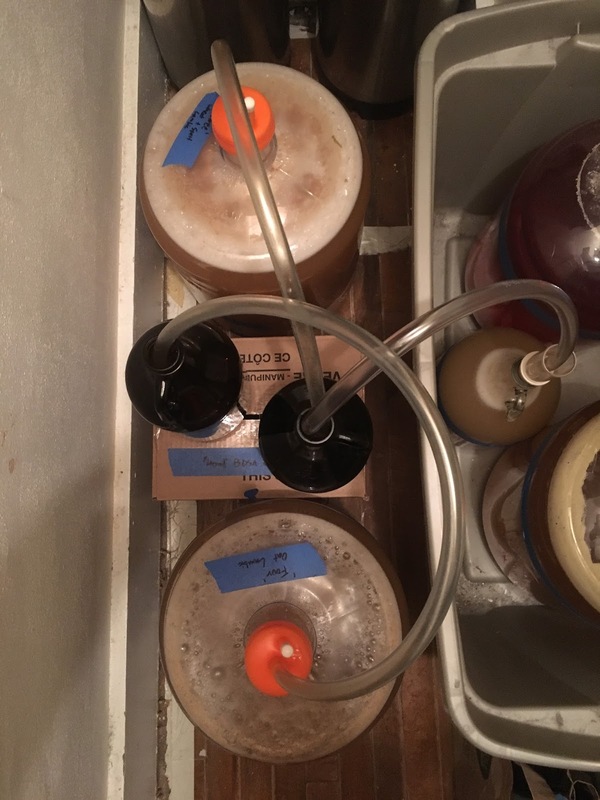 I afforded the larger batches extended time in the fermenter of at least 14 days to allow the yeast plenty of time to clean up any residual off flavors that may have popped up in the larger batches. For packaging I recommended my favorite bottle: a Morning style bottle with dark green glass. The presentation of beer in this style of bottle is elegant and it has that "I want to know what's inside that bottle" quality. They are also very functional in that they help to minimize settled yeast from entering your glass, which was a plus given my audience. To adorn the bottle, simple brown tags were stamped with my logo and tied to the bottle with some classy intertwined red and white string. Once all of the bottles had finished carbonating, they were placed upright in the refrigerator for one week prior to serving to allow for natural yeast settling and CO2 integration. At the advice of the kitchen staff, my beer was to be served with the first course of the five course Cortile Dinner. The first course was a beautiful spiced sourdough bread made by one of the kitchen interns, Daniel Green. Daniel is a master of bread. When he began his stint as an intern, he introduced his homemade sourdough bread to dinners. Once the introduction was made, each and every bread basket was empty by the end of dinner service. For the Cortile Dinner, a small serving of sorghum butter with sea salt was provided with the sourdough bread. They were a match made in heaven. To top it all off, not only could you eat the bread and butter, but you could wash it down with "Tavolo," my Belgian Table Saison. Appearance: Brilliant golden hue. Fluffy white head with great lacing. Aroma: Malty sweet and yeasty like unbaked bread dough. A little bit of umami. Slight baking spice. Flavor: Creamy, doughy maltiness. Earthy like fall leaves. Grilled mushrooms. Clove. Mouthfeel: Moderately full body with a distinctly dry and tingly finish. Overall: A refreshing and pleasing beer with doughy malt, earthy yeast, and subtle spice in the background. Before I lay out the specifics of the recipe, I have to give my thanks to several people. 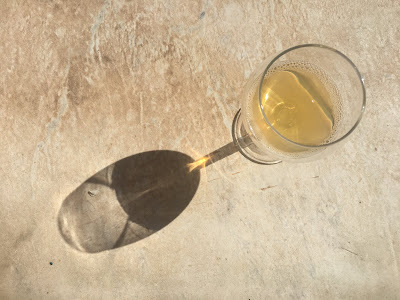 First to Chris Behr, for coming up with the idea of serving beer at the Cortile Dinner and for standing by this idea, even when there was opposition. Second to all of the hard working full time kitchen staff at the Academy from the sous chef to the dishwashers. This includes Kyle Pierce, Sara Levi, Valentina Montrone, Alessandro Lima, Tiziana Del Grosso, Gabriel Soare, and countless others. Third to Daniel Green, for some fantastic conversations about beer and bread in addition to all of those tasty loaves I destroyed. And finally to my wife Cate for supporting me and my passion without hesitation. Every morning I woke up at the American Academy in Rome this spring I was greeted by the delicate smell of freshly blooming jasmine flowers. The Academy has a beautiful inner courtyard known to the community as the Cortile. A stone path encompasses the Cortile where several columns stand and act as the perfect home to several jasmine flower vines. Luckily, my bedroom window just so happened to be right above some of the most aromatic vines. When you enjoy brewing traditional beer styles like Saison, you tend to consider what brewers were doing back in the old days. Knowing that Saison was a beer brewed on a small scale with local ingredients my mind took inspiration from the things that were close to me (physically). I have never brewed a beer with flowers before, but I dove straight in because I was enthusiastic about the potential of this jasmine. It is a common ingredient used in tea and it seemed like a natural fit for Saison yeast. In developing the recipe I was apprehensive with my use of jasmine. I didn't know what kind of bitterness the raw flowers might impart. In my head I assumed that it would be roughly equivalent to a soft noble hop type bitterness. Opposite that, I also thought about the herbal sweetness the flower might provide. I settled on a value of around 2 g/L of freshly picked jasmine flowers. I chose to steep them as if I were making a tea during a whirlpool addition at ~180 F for 5 minutes. The taste of the wort following the steeping and prior to the introduction of yeast was decidedly floral and slightly tannic. To complement the jasmine, I first focused on the malt bill. I wanted it to be relatively clean with a soft graininess and subtle, round sweetness. My base was Dingeman's Pilsner, a go-to for my Belgian Saisons. I amped up the sweetness with a little Vienna and Golden Promise. Finally, to add a touch of soft grain character, I included flaked spelt. For bitterness from the hopping, I emphasized a clean touch of Magnum at around 35 IBU's. Amping up the herbal character, I added a moderate amount of East Kent Goldings near the end of the boil. Finally, I chose to blend two of my favorite yeast strains: White Labs 'Belgian Saison I' and Imperial Organic's 'Rustic' to give an expressive yeast character that would still let the malt shine. Appearance: Slightly hazy gold. Creamy white head. Aroma: Distinctly floral with a comforting background of sweet malt. Flavor: Pear, soft malt, lemon balm, fresh flowers. Mouthfeel: Prickly carbonation with a moderate to full body. There is a slickness on the tongue, but it finishes very dry. Overall: Pleasant, easy drinking beer with a surprising balance of sweet malt, yeast expression, and floral undertones. My adoration for Brasserie Dupont's "Avec les Bons Veoux" began several years ago. The first time I had it I was blown away by the beer's ability to balance such a big, rich malt character with a beautifully spicy yeast expression. Knowing it is brewed in celebration of New Years, a couple years back I decided to begin drinking it instead of champagne on the 31st. Garnering inspiration from ALBV, I decided to craft something similar that packs a bit more punch than a traditional Saison. In designing the beer, I knew I wanted a complex, rustic malt character with a distinctly dry finish. I love including unmalted grains other than barley in my Saisons and this beer is no exception. To amp up the earthiness of the malt profile I used a combination of equal parts flaked spelt and flaked rye. Additionally, I included a portion of Vienna to enrich the maltiness and lend a subtle toasty note. To round out the fermentables I added corn sugar to ensure the beer would attenuate to around 1.010 or less for a dry finish. To provide a similar yeast profile as ALBV, I chose White Labs Belgian Saison I. Purported to be isolated from Brasserie Dupont, this strain exhibits a lot of the character people associate with the Saison style due to Saison Dupont's popularity. It is distinctly earthy and peppery while lending a subtle, pleasing tartness. I've brewed with both this strain and the Dupont-isolated Wyeast strain (Wyeast 3724 Belgian Saison), but I've found I prefer the White Labs strain. There are a lot of similarities between the two strains, but I prefer the more pronounced spice profile I get from the White Labs strain. To avoid the maniacal "Saison-stall," I take Drew Beechum's advice and open ferment the beer for the first couple days of active fermentation. Finally, as I am living in Rome, I decided to take advantage of the early winter harvest of citrus fruits in the Mediterranean. I decided to use fresh bitter orange grown on the grounds of the American Academy in Rome and picked by the crew of the Rome Sustainable Food Project. Knowing I wanted to infuse the flavor and aroma of orange into the beer, I decided to zest the oranges and add it as both a hot side and cold side addition. Hello beer brewing friends! I apologize for the long hiatus. In addition to getting accustomed to my new lifestyle in Italy, I've been working out a few kinks on my new brewing system. As mentioned in a previous post, since moving to Italy I've made several changes to my process. The most difficult of the changes I've encountered thus far has been working with the tap water. After finding a report from the Roman water utility, I made use of the Water Profile tool in Beersmith to get a feel for what I was working with. As you can see below the water is extremely alkaline (the red dot gives it away). Thinking I may be able to work around this alkalinity in a similar manner as I had in the past, I decided to use food grade lactic acid to counteract the alkalinity in the water. I found that a large quantity of acid was necessary to obtain a mash pH in my desired range. The beers that resulted from this water modification had a distinct, artificial "twang" to them. After doing some online research, I determined that the culprit of this strange flavor was the acid. In order to find an alternate method to counteract alkalinity, I investigated the online forums provided by the American Homebrewers Association (AHA) and dug a little deeper into 'Water' by Palmer and Kaminski. I determined that I had two options for reducing the alkalinity in my brewing water: pre-boiling or pre-treating with lime. Both methods result in the reduction of bicarbonate (HCO3-) through the precipitation of chalk (calcium carbonate / CaCO3). Pickling lime to the rescue. Based on energy intensity and the likelihood for mineral deposits in my boil kettle, I decided that pre-boiling was not the route I wanted to go. Instead, I got my hands on some pickling lime (calcium hydroxide / Ca(OH)2) and followed Braukaiser's well written guide on reducing alkalinity. My process looks very similar to the one outlined in the guide. I first filter warm tap water through an activated carbon filter to remove chlorine and transfer it to a large bucket that I use as a treatment vessel. I add equal parts calcium chloride and calcium sulfate to my carbon filtered tap water to increase the calcium content and maximize the precipitation of chalk. Following this addition I add lime, stir well, and allow anywhere between 12 and 24 hours for the precipitated chalk to settle. Once settling is complete I decant the treated water off of the settled chalk using my auto siphon. Utilizing this very simple process I have found that the amount of acid necessary to achieve an appropriate mash pH is significantly reduced and the strange "twang" character I had in beers modified solely with acid has been eliminated. Settled chalk after water treatment. We made it! My wife and I put ourselves through a bit of a grueling travel schedule, but we're here. Other than a bit of jet lag, our experience has been fantastic. Great people, delicious food (shout out to Rome Sustainable Food Project), and gorgeous weather. I can't find the words to describe how amazing our stay has been thus far at the American Academy in Rome. Moving from one country to another while continuing to homebrew is not exactly the easiest thing in the world. I brought one backpack, one carry on suitcase, and one large suitcase with me. I dedicated about half of the carry on bag to brewing. I packed away some of my smaller instruments and PPE such as my pH meter, refractometer, and brewing gloves knowing the bigger stuff wasn't worth the packing space. I'm reducing my batch size to limit the amount of ingredients (and money) I need to brew each batch. Obtaining reverse osmosis water in a large city without a car seems a bit overwhelming, so I'm placing my bets on being able to work with the water in Rome. This is the thing I am the most concerned about. I'm buying larger quantities of grain to be shipped to me which means I'll have a bit less flexibility in malt choice. Additionally, I'll be hand milling my grain at home. I'll be trying out the Brew in a Bag technique for the first time to limit the number of hot side vessels I'll need. And finally, I'll be fermenting at ambient temperature. To circumvent the lack of fermentation temperature control, I'll be using mostly Belgian strains. Five brewing books made their way with me too. Farmhouse Ales, Session Beers, American Sour Beers, Brew Like a Monk, and Wild Brews. After reading this list of books, you probably have some sort of idea of the beers I plan to brew in Rome. My primary focus will be on low-ish alcohol beers of Belgian origin, specifically saisons both of the single and mixed fermentation varieties. As mentioned in an earlier post, I will also be using solely European ingredients in these beers. I'm specifically interested in continuing to explore more of the Noble hop varieties in addition to some of the newer, fruitier German varieties. For now, I'm anxiously awaiting the arrival of my equipment. Look for brew day posts in the next month or two! Beers that contain saccharomyces, brettanomyces, pediococcus, and lactobacillus are easily my favorite type of beer to consume. The complexity that can be attained from using yeast and bacteria is truly amazing. Tart, funky, earthy, fruity, rustic, barnyard: these are just a few of the characteristics you can find in this style of beer. The intermingling of these aromas and flavors results in a truly unique, flavorful, and intricate liquid. It is because of this that my desert island beer is most certainly of the mixed fermentation variety ; every time you drink a mixed fermentation beer, you discover something new. While I am in Rome for just short of a year I figured I have a unique opportunity to age mixed fermentation beer because they take on the order of 6 months to 3 years to fully mature. The primary goal of these beers is to emphasize the expression of the yeast and bacteria in the finished product. In order to do this, I have chosen to follow Michael Tonsmeire's advice from American Sour Beers to pitch both a fresh package of a sour yeast blend along with dregs from commercially available sour beer. This method improves the biodiversity in order to promote complexity. Also, per Mike's recommendation, the sour yeast blend and sour beer dregs were pitched in the primary at the same time as the saccharomyces to give them a head start. Outside of microbe selection, I designed the beers to be in the ~ 5 to 6 % ABV range. This isn't exactly session strength but it's close. The lower alcohol also helps to reduce the stress on the younger microbes that are joining the party. I designed the grain bills to be somewhat similar to traditional lambic beer in the sense that they are around 65% malted barley and 35% of something that is not barley. This helps to provide varying types of food for the microbes to "chew" on. As for hops, I stuck with a simple bittering addition of around 10 IBU's with a lower alpha acid variety. Pitched Dregs from Mindful Ales "Winds and Turns"
I've started down the session beer path, and I don't think I'm going back. My favorite way to consume beer is to drink many without feeling fuzzy afterwords. This allows for more smells and sips of that precious liquid we all know as beer. I wanted these Brett Saisons to be in the ~4 to 5% ABV range to make them both session-worthy and to allow for them to finish on the lower end of the gravity spectrum. The lower finishing gravity is to avoid bottle bombs as I plan to package these beers somewhat early for beers brewed with Brettanomyces (~2 to 4 weeks in the fermenter). Additionally, I designed these beers such that they will develop and change over time. I chose this concept because I'm moving to Rome, Italy in September. I'm following my wife who obtained an amazing pre-doctoral fellowship called the 'Rome Prize.' The opportunity supports her in writing her dissertation while immersing herself in all that is Rome. I plan to continue homebrewing while overseas, and in particular I'm looking forward to trying some fresh European ingredients like British malt, German hops, and whatever I can find that is unique to Italy. Grisette - Soft, grassy, funky. Spice and Fruit - An investigation of the intersection between spice and fruit. Hops - New world, hop-forward. 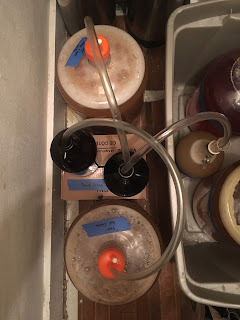 Last summer I made a clean, grisette-style beer with The Yeast Bay's Wallonian Farmhouse yeast. The beer was highly carbed, easy on the pallete, and great for the humid months. This year I decided to loosely follow a similar concept, but I decided to funk it up a bit. For the grist I focused on wheat and spelt for a softer grainy character. Classic, noble-type hops are present to emphasize herbal and grassy characteristics. Finally, I pitched Brussels Brettanomyces Blend from the Yeast Bay to milk the funk. After attending Homebrew Con 2017 in Minneapolis I returned home with some hops I had never used before: HBC 342 and Loral. I thought it would be fun to test them out in this recipe. To emphasize the "spice" aspect I chose flaked rye and Loral hops. I've always found that flaked rye provides a very strong earthy character to beer so I tried to soften it with flaked wheat. Loral purportedly provides a nice punch of floral and pepper character so I thought it would lend itself to the spicy element of the beer. Nelson, HBC 342, and Claussenii check the "fruity" box. I had a couple one ounce packages of Nelson hanging around so I decided to use them up. Nelson can provide an amazing complex fruitiness that is nearly impossible to replicate using other varieties. To further amplify the fruitiness I pitched White Lab's Brettanomyces Claussenii, one of the fruitier Brett's available to homebrewers. This photo is your prize for making it this far in the post. This beer was brewed with my neighbor in mind. We are both moving out of our current apartment in Madison that we've been at for 5 years. He is a lover of hops so I decided to brew this one with him in mind. I've always wanted to brew with Calypso and I chose to emphasize it in this recipe. My neighbor also enjoys Bell's Two Hearted and Lagunitas IPA, so I decided to use some Centennial and Columbus to emphasize the piney and woodsy side of the hop spectrum. The flaked oats are there to help out with the body, and I added some Vienna for complexity.